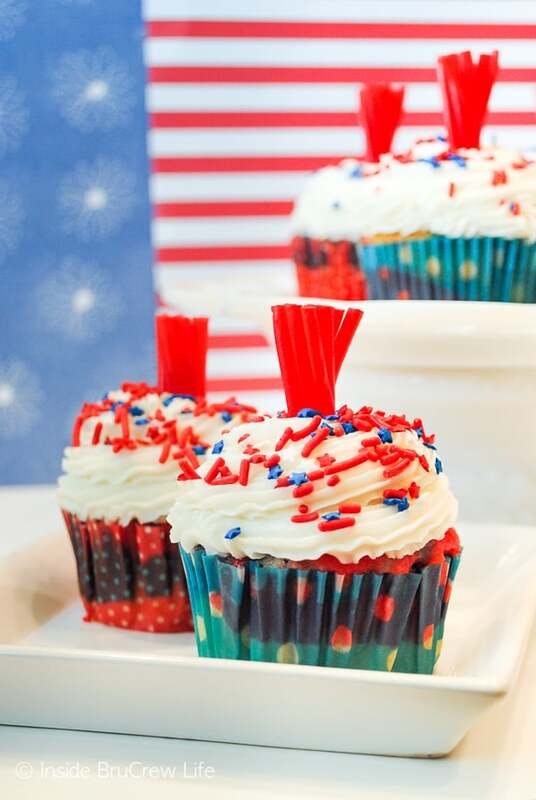 These fun Firecracker Cupcakes have a red, white, and blue surprise inside. A licorice topper and sprinkles make these patriotic treats so fun to eat and share at summer picnics or barbecues. 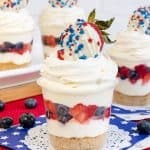 Do you need a super easy and fun dessert for the Fourth of July??? My daughter and I had so much fun making these red, white, and blue Firecracker Cupcakes and this Red White and Blue Bundt Cake together. These are the perfect summer cupcake to bake with your kids. We loved seeing how different each cupcake baked up depending on what color we started with on the bottom. 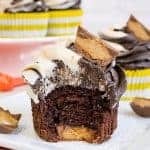 The cupcake recipe you use below will determine how swirled the colors will bake. One recipe will create layers, and the other recipe will create swirls. Mix up your cake batter using a box mix, pudding mix, eggs, water, and oil. (If you want to go the easier, swirled route, just make the recipe on the back of the box.) We like to jazz up our cupcakes with a pudding mix because it gives it such a great texture and taste. Divide the batter evenly into 3 bowls. Tint two bowls with red and blue gel colors. Place 24 liners in a cupcake pan. Place 1 spoonful of each color in the bottom of each liner. Repeat with spoonfuls of the other two colors. You can alternate which color you start with to make each cupcake different. Bake and cool. Swirl the vanilla frosting on top of the cooled cupcakes using an icing bag and icing tip 1M. Top with red, white, and blue sprinkles and a licorice candy fuse. 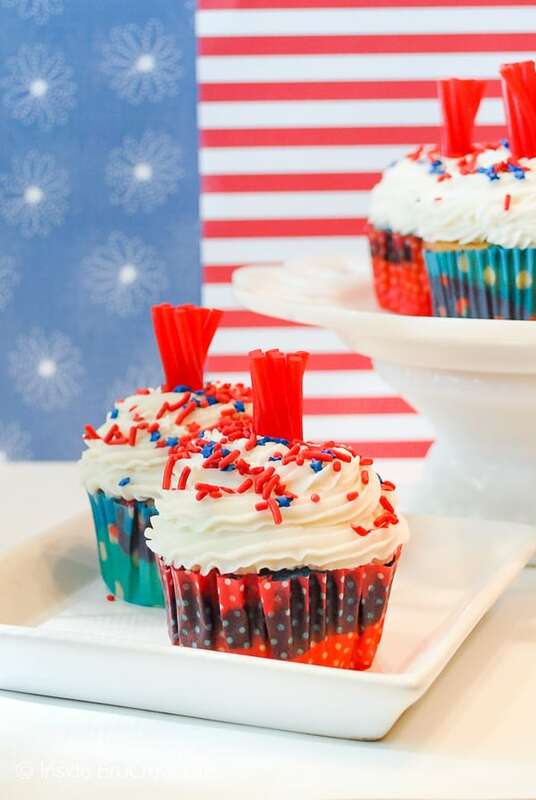 Take these Firecracker Cupcakes to all the summer picnics you are invited too. But BEWARE because once people know you can make such cute stuff, it will be expected for every 4th of July picnic you attend. 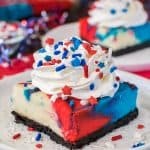 Swirls of colors make these Red, White and Blue Cheesecake Bars a fun dessert to share at holiday parties this summer. 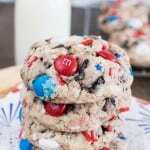 Sprinkles and holiday M&M’s make these Fireworks Cookies and Cream Cookies a great summer treat for the cookie jar. These easy No Bake White Chocolate Cheesecake Parfaits have layers of cookies and fruit and a chocolate covered strawberry. The swirls of color in this 4th of July Tie Dyed Fudge from Taste & Tell is so fun! A batch of Red, White, and Blue Stained Glass Jello Stars from Brown Eyed Baker would be perfect for holiday picnics. 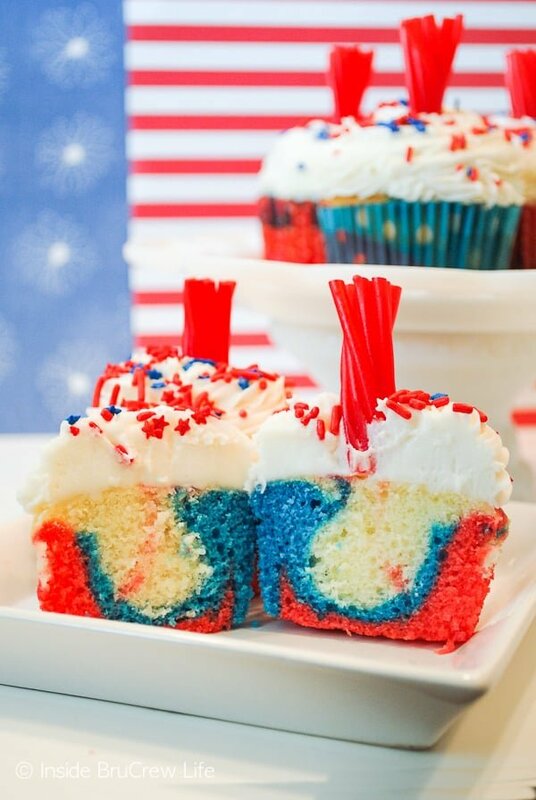 These fun Firecracker Cupcakes have a red, white, and blue surprise inside. A licorice topper and sprinkles make them fun to eat and share at any summer picnic. Preheat oven to 325 degrees. Place 24 liners in a cupcake pan. Beat together the cake mix, pudding mix, water, oil, and eggs in a mixing bowl. Beat for 1 minute on low, and 2 minutes on medium. Divide the batter evenly into 3 bowls. Add a little red and blue food coloring to two of the bowls. Fill your cupcake liners 2/3 full by alternating colors 1 Tablespoon at a time. Change it up by starting with a different color each time. Bake 20-22 minutes or until the top springs back. Remove and place on a wire rack to cool completely. Beat the butter, salt, and vanilla until creamy. Slowly add the powdered sugar and heavy whipping cream until completely mixed in. Beat on high for a minute or until light and fluffy. Use an icing bag and icing tip 1M to swirl the frosting on the cooled cupcakes. Push a short piece of licorice into the top of each cupcake and add sprinkles on top. Store in a loosely sealed container. *To get swirls like the pictures, just use the ingredients from the back of the box. **Using the pudding mix recipe will give you cupcakes that look like the video. We prefer the taste and texture of this version more. *This post was originally posted in June 2011. These are cute, and look yummy! I wish it wasn’t so hot, I’d whip some of these up in a heart beat! yep – think i will make these for our weekend party! the kids will love them! Those are too cute! I love the little surprise color inside too! Oooh! These are a must for our 4th of July picnic! And one more thing – your blog looks awesome. Like deliciously awesome! Super cute and perfect for the 4th! I bet their yummy too! Thanks for linking up to this week’s Catch a Glimpse party. New follower sent from Women Who Do It All. Jocelyn, thank you so much for being a part of the festivities at Rook No. 17! I love these cupcakes! 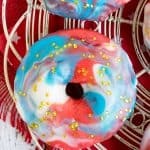 I wish you (and your cupcakes) could have come to our real-life 4th of July party! My favorite part of these is the licorice topper — very clever!! 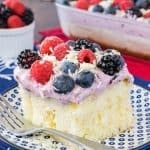 I love that you group all your red white and blue dessert recipes here for me to choose from for this year. 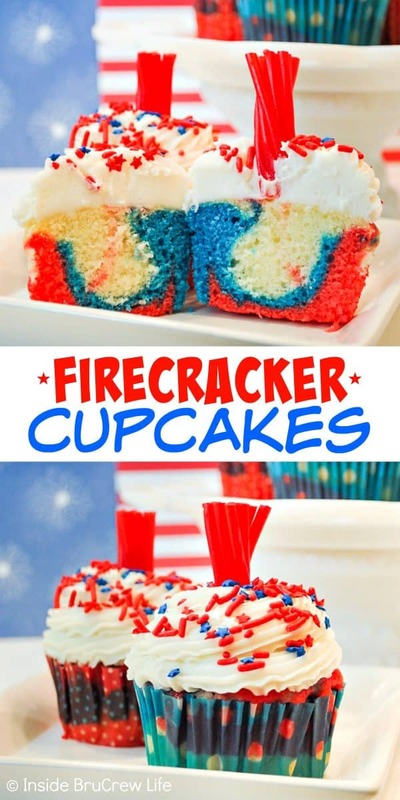 The firecracker cupcakes are my first choice. You are SSSOOOOO right about the great flavor and silkiness that the pudding addition adds to the recipe. PERFECT!!!!!! !